Bish, Bash, Bosh – Chocolate fudge cake, with a twist! It’s that time of year again where we all gorge on delicious homemade bakes in the name of charity…Macmillan’s World’s Biggest Coffee Morning! Now in its 28th year, the charity campaign has raised over an incredible £200 million since it began in 1990. With hundreds of thousands estimated to be baking all across the country, being a catering company we obviously like to get involved! This year we’ve decided to shine a light on a specific diet which we’ve seen grow in our sector rapidly in recent years, veganism. With now more than half of UK adults (56 per cent) adopting vegan buying behaviours and World Vegan Month just around the corner in November we asked our Sales & Marketing Manager (and token vegan) Clare Mortiboys to share her thoughts on veganism in the catering industry and more importantly the recipe she’s chosen this Coffee Morning. Clare, who became Vegan as part of the campaign Veganuary in January this year has never looked back and has often wowed colleagues and sceptics with her lunch concoctions and dinner left overs. She is our head office’s “Go-To-Vegan” if you have a question about veganism or how to make a recipe vegan, you go to Clare. “I have to say I feel a bit of a cheat choosing to go vegan this year, it was tipped early on to be a top consumer trend for 2018 which means it’s easier than ever to adopt a plant-based diet. The high street and retailers have really stepped up vegan options in recent months and have some really appealing and delicious products on offer. Eating out is easy with many restaurants and cafes now offering multiple vegan options, entire vegan events and simple things like plant-based milk alternatives. My experience of vegan options within the events industry, however, hasn’t been quite so exciting with many caterers and venues yet to embrace the trend in quite the same way as the high street. 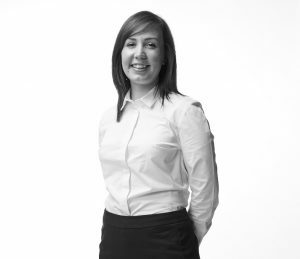 Clare has worked at CGC for 8 ½ years. Her role sees her oversee all of the sales and marketing provision as well as business growth, sustainability and corporate responsibility. 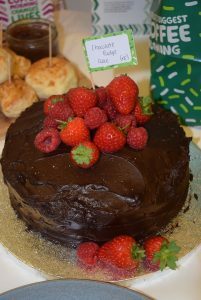 Why not dabble in a bit of veganism this Coffee Morning and have a go at making Clare’s choice of bake, this delicious chocolate fudge cake by vegan cook extraordinaire duo, Bosh . People won’t believe it’s vegan! 1. Lay the cake tins on the parchment paper and draw circles around the bases, then cut out the circles. Grease the inside of the tins with dairy-free butter and lay the paper circles in the bottom. Grease with more dairy-free butter. 2. First make the cake. Put the flour, cocoa powder, baking powder, vanilla extract, maple syrup and plant-based milk in the food processor and whiz to a batter (or put in a bowl and whisk with the electric beater for 1-2 minutes). 3. Pour half the cake batter into each tin, making sure it is divided equally. Put the tins in the oven on the middle shelf and bake for 25 minutes. Don’t worry if the tops of the cakes crack a little while baking, this will all be covered in icing later. Wash the food processor. 4. Take the cakes out of the oven and let them cool to room temperature in the tins. The sponges will be quite fragile, so carefully turn them out of the tins on to the cooling rack and put the rack in the refrigerator for at least 30 minutes (this will make the icing process easier). 5. To make the icing, put the cocoa powder, icing sugar, dairy-free butter, vanilla extract and plant-based milk into the food processor and whiz to a really thick, smooth icing (or put them in a bowl and whisk with the electric beater). 6. Take one layer of the cake and put it on a large plate. Using a spatula or long knife, cover the top with a third of the chocolate icing. Lay the second cake on top. Cover the whole cake with the rest of the icing. Put the cake in the fridge for 1 hour to firm up. Remove from the fridge, cut it into slices and serve. Join in the conversation online by using the hashtag #Coffeemorning on Twitter, a look out for our Head Office Bake-off competition in aid of the day and see who our winner will be this year!